Jadyn LaDeau is the only skater on the ice during a quiet skate at Blue Hill Peninsula Skating Rink on a chilly January 7 afternoon. The Blue Hill Peninsula and Deer Isle have seen little snow this winter season. The new year has brought some cooler temperatures, and recent snow finally seems to be accumulating on walking trails throughout the area, making it easier for outdoor enthusiasts to enjoy the fresh air. Blue Hill Heritage Trust provides ample opportunities for outdoor enjoyment during the winter, with a monthly hiking series at a different location. The hikes are led by Outreach Volunteers with BHHT and include a variety of activities, including snowshoeing and ice creepers. Depending on the weather and ground conditions, boots are a sufficient means of getting around as well. Many of the trailheads for BHHT trails are plowed out during the winter months to give people access to the trails, according to Outreach Director Chrissy Allen. The plowing is done by volunteers who usually live near the property. The Blue Hill Peninsula Skating Rink is another place for outdoor activity during the winter months. 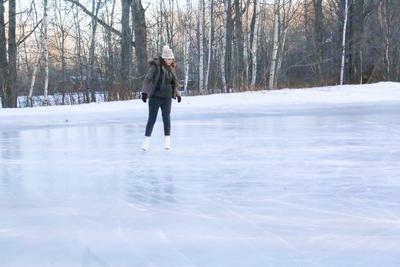 The rink is maintained by volunteers, and is open to skaters daily. Pick-up hockey games are also played during the week. Announcements and rink conditions can be found on the rink’s Facebook page. The Blue Hill Peninsula Nordic Ski Club offers opportunities for the area youth to get involved in outdoor activities as well. The club checks out cross country skis to anyone interested in using them at the Manor Inn in Castine and provides instruction for those just starting out. The ski program is offered for children ages 3 to 12. Those looking to sign up for the program can email bluehillpenski@gmail.com for registration information. Castine also offers hiking trails throughout Witherle Woods, for snowshoes, cross country skis or just boots on the ground. A small parking lot next to the Manor Inn is plowed out and provides direct access to the trailhead. On the island, hiking along Settlement Quarry and Barred Island trails are open during the winter months, and they have parking access at the trailheads. For more casual jaunts, the beaches are also open with minimal snow coverage. Island Heritage Trust also holds monthly bird walks at Scott’s Landing with trust director Paul Miller. They are scheduled for 8 a.m. on the second Saturday of every month, and binoculars for those who need them can be requested a couple days prior to the walk by calling the Island Heritage Trust office. When the ice freezes on lakes and ponds, ice fishing is also a popular recreational activity in the area during the winter time. The Maine Department of Inland Fisheries and Wildlife urges caution when going out on the ice, and being aware of ice conditions. More complete information can be found by accessing the website of both area trusts, at bluehillheritagetrust.org and islandheritagetrust.org.